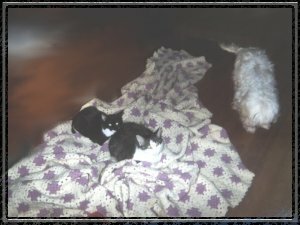 I cannot remember a time in my life when I did not have a cat and at least one dog sharing my home. I've always loved dogs with their gentle loyalty and unconditional love. But I have to admit I have a special fondness for cats. Cats are beautiful, graceful, loving and independent. I don't have photos of all the animals I've loved in my life but one day I hope to be able to introduce most of them here. Cat Declaw. If it's such a great idea, why are so many speaking out against it? Some of the websites below (or links from those sites) contain VERY graphic images. Please supervise children on the internet. They say a picture is worth a thousand words. I'm hoping that is true. Please don't amputate your cat's toes. Please be advised that the official position of the American Veterinary Medical Association (AVMA) is that unless it is a medical necessity for the cat or if clawing presents a potential zoonotic (medical) risk to its owner(s), declawing should be considered only as a last resort and only after a full understanding of the declaw procedure and alternatives to it have been presented. Article and information on how to solve cat scratching problems written by a veterinarian. TheCatSite.com Forums, Cat Care, and more.